← Good News for Pavtube Video Converter for Mac— Upgrade to Version 4.8.5.0! 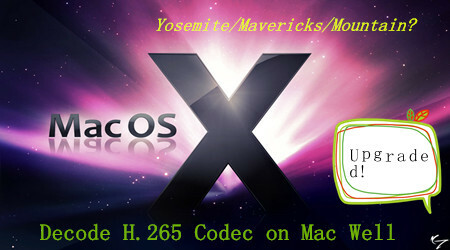 Are you still confused with the H.265/HEVC recordings on Mac? No good measures of watching H.265/HEVC videos smoothly to enjoy the high quality? Here we can drop all the related troubles away! With the announcement of Pavtube Video Converter for Mac has upgraded to the latest version 4.8.5.0 from Pavtube studio, this program can decode the H.265/HEVC files to any other suitable formats for any devices. It is an all-in-one media conversion program that can almost handle all videos nicely here. With this professional video converting tool, we can have free access to watching SD videos (e.g. YouTube FLV/F4V, MP4, AVI, MPG, WMV, etc), digital camcorder recordings (e.g. MXF, MTS AVCHD, MOV, MP4, MVI, etc), DVR videos (Tivo), audio files (e.g. MP3, MP2, WMA, FLAC) on devices such as Apple/Android/Windows series, media players, game consoles, etc. What are new features of this new upgraded program? Convert between the most popular media formats with this Video Converter for Mac: DVD, AVI, MP4 (including H.264 codec), FLV, SWF, MPEG-1,2, MPEG-TS, WebM, OGV, RM, 3GP, MKV, WMV, and QuickTime video (MOV). Process 4K Ultra HD video. Upscale SD to HD. Convert audio files in AAC, FLAC, MP3, Monkey’s Audio, OGG, WAV, M4A, and WMA. Now you can convert image files too! Watch your movies and clips on any mobile device: just choose your model from the list and convert video on your Mac for Apple iPad®, iPhone®, iPod®, Apple TV®, Android smartphones and tablets, Sony PSP, and more. Over 40 new optimized conversion presets for iPhone 6, HTC One mini 2, BlackBerry Z30, Samsung Galaxy S5 and Galaxy Tab 4, Sony Xperia Z2, Sony PlayStation 4, Xbox One, and other new devices. Take advantage of the handy editing tools that let you adjust your video however you want. Cut or trim media files and convert any selected section of your movie. Merge multiple video or audio files. Crop, flip, and rotate your footage. Fine-tune video parameters: brightness, contrast, and more. Improve the quality of your video with the help of auto filters. Add captions and overlay watermarks to complete your video. Notes: For Windows users, we can offer the Pavtube Video Converter for all of you! Only $9.9 to get the best H.265 Encoder, Decoder software – Pavtube Video Converter for Windows/Mac by joining Pavtube Black Friday & Cyber Monday Crazy Promotion.More surprises are waiting for you.